I love soaking up all the “best of” lists that come out this time of year, all those recaps of the year in film, music, art, and books. It gets expensive though, because I try to load up on all the stuff I missed. Driving in the car a few days ago, I was moved to hear the end of an interview on NPR’s “Fresh Air” between Terry Gross and Maurice Sendak. Sendak, at age 83, sounded vulnerable and wistful, full of sadness and self-knowing, bravery and hard-earned wisdom, nearing life’s end and yet unblinking. I urge you to click here and hear him for yourself, because there’s a feeling to his words that only sound can convey. It’s the difference between hearing a song and reading the lyrics on a page. SENDAK: I’m not unhappy about becoming old. I’m not unhappy about what must be. It makes me cry only when I see my friends go before me and life is emptied. I don’t believe in an afterlife, but I still fully expect to see my brother again. And it’s like a dream life. But, you know, there’s something I’m finding out as I’m aging that I am in love with the world. And I look right now, as we speak together, out my window in my studio and I see my trees and my beautiful, beautiful maples that are hundreds of years old, they’re beautiful. And you see I can see how beautiful they are. I can take time to see how beautiful they are. It is a blessing to get old. It is a blessing to find the time to do the things, to read the books, to listen to the music. You know, I don’t think I’m rationalizing anything. I really don’t. This is all inevitable and I have no control over it. “Bumble-ardy” was a combination of the deepest pain and the wondrous feeling of coming into my own and it took a long time. It took a very long time, but it’s genuine. Unless I’m crazy. I could be crazy and you could be talking to a crazy person. GROSS: I don’t think so. GROSS: My guest is Maurice Sendak. He has a new children’s book called “Bumble-ardy.” We’ll talk more after a break. This is FRESH AIR. What are your physical restrictions like? Can you walk OK? Can you get around? SENDAK: No, I can’t walk OK. I’d love to walk. That’s why I’ve been doing that since the ’70s when I had my first coronary. I have heart trouble and I’ve had a very bad time after Eugene died and I was very sick and they thought I would die and I came back to do “Bumble-ardy.” And I have nothing but praise now, really, for my life. I mean I’m not unhappy. SENDAK: …because new people have died. SENDAK: They were not that old. And so it’s what I dread more than anything is the isolation. SENDAK: But I have my young people here, four of them who are studying and they look at me as somebody who knows everything, those poor kids. SENDAK: SENDAK: If they only knew how little I know. But obviously I give off something that they trust, because they’re all intelligent. Oh God, there are so many beautiful things in the world which I will have to leave when I die but I’m ready, I’m ready, I’m ready. GROSS: Well, listen – yeah. SENDAK: You know, I have to tell you something. SENDAK: You are the only person I have ever dealt with in terms of being interviewed or talking to who brings this out in me. There’s something very unique and special in you, which I so trust. When I heard that you were going to interview me or that you wanted to, I was really, really pleased. 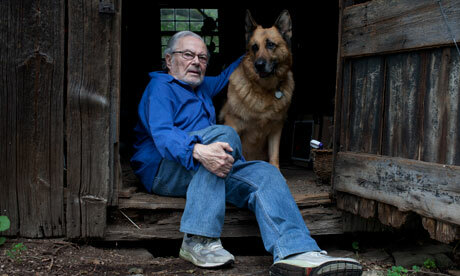 GROSS: …to call up Maurice Sendak and have a chat. SENDAK: Yes, that’s what we always do, isn’t it? SENDAK: That’s what we’ve always done. SENDAK: Thank God we’re still around to do it. SENDAK: And almost certainly, I’ll go before you go, so I won’t have to miss you. SENDAK: And I don’t know whether I’ll do another book or not. I might. It doesn’t matter. I’m a happy old man. But I will cry my way all the way to the grave. GROSS: Well, I’m so glad you have a new book. I’m really glad we had a chance to talk. GROSS: And I wish you all good things. SENDAK: I wish you all good things. Live your life, live your life, live your life. You can go here to find “the best of fresh air 2011.” It’s so easy to download these interviews for free, or subscribe to podcasts, and play them on your iPod at your convenience — at the gym, on a walk in the neighborhood, wherever. Again, it’s just incredible that we have these resources available to us. It another reason why it’s so important to value, and Support Public Radio. Now I think I’m going to find a window and look at some trees, and take time to see how beautiful they are.